"Evolutionary Design by Computers offers an enticing preview of the future of computer-aided design: Design by Darwin." - Lawrence J. Fogel, President, Natural Selection, Inc. Some of the most startling achievements in the use of computers to automate design are being accomplished by the use of evolutionary search algorithms to evolve designs. Evolutionary Design By Computers provides a showcase of the best and most original work of the leading international experts in Evolutionary Computation, Engineering Design, Computer Art, and Artificial Life. 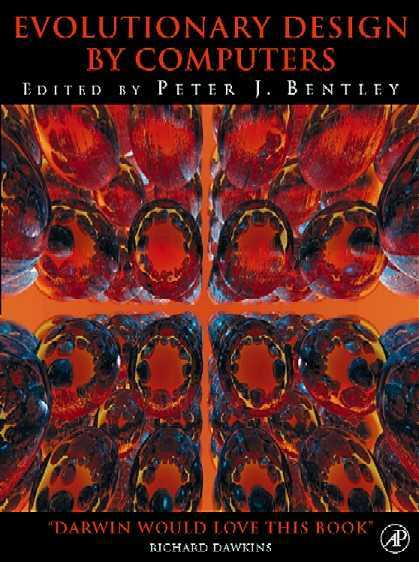 By bringing together the highest achievers in these fields for the first time, including a foreword by Richard Dawkins, this book provides the definitive coverage of significant developments in Evolutionary Design. It shows for the first time how techniques in each area overlap, and promotes the cross-fertilization of ideas and methods. A CD-ROM is included with the book, providing the reader with hands-on activities, evolved images, animations, and source code related to the text. Evolutionary Design by Computers will be an essential resource for researchers in academia and industry. Mitsuo Gen & Jong Ryul Kim. 1. Evolutionary Computation / Evolutionary Design / Problems in Evolutionary Design. 2. The Interplay of Evolution and Insight in Design. Michael French. 3. The Memetics of Design. Derek Gatherer. 4. The Race, the Hurdle, and the Sweet Spot: Lessons from Genetic Algorithms For the Automation of Design Innovation and Creativity. Dave Goldberg. 5. Exploring the Design Potential of Evolutionary Search, Exploration and Optimization. Ian Parmee. 6. Optimization in Mechanical Design. Gordon Robinson, M. A. El-Beltagy & Andy Keane. 8. GA-based Optimisation of Reliability Design. Mitsuo Gen and Jong Ryul Kim. 9. The Mutation and Growth of Art by Computers. Stephen Todd and William Latham. 11. Evolutionary Art and Form. Andrew Rowbottom. 13. Evolving Three-Dimensional Morphology and Behaviour. Karl Sims. 14. Exploring Three-Dimensional Design Worlds using Lindenmeyer Systems and Genetic Programming. T. Broughton, Paul Coates, Helen Jackson. 15. Evolving Designs by Generating Useful Complex Gene Structures. Mike Rosenman and John Gero. 16. The Design of Analog Circuits by Means of Genetic Programming. John Koza, Forrest H Bennet III, David Andre, Martin A Keane. 18. From Coffee Tables to Hospitals: Generic Evolutionary Design. Peter Bentley.